A 2019 Chevy Corvette Grand Sport has been reduced to shiny pile of disappointment, before its odometer even broke out of the teens. Forget “not broken in,” this poor thing barely broke out of the dealership parking lot. Originally, we had no idea as to whether this is the result of a new driver with more enthusiasm than self control, or just a secondary victim in another depressing mishap. Though it sure looked like the ’Vette hit something square in the left headlight with some momentum. Updated: Wednesday, July 18, 2018, 12:30 p.m. 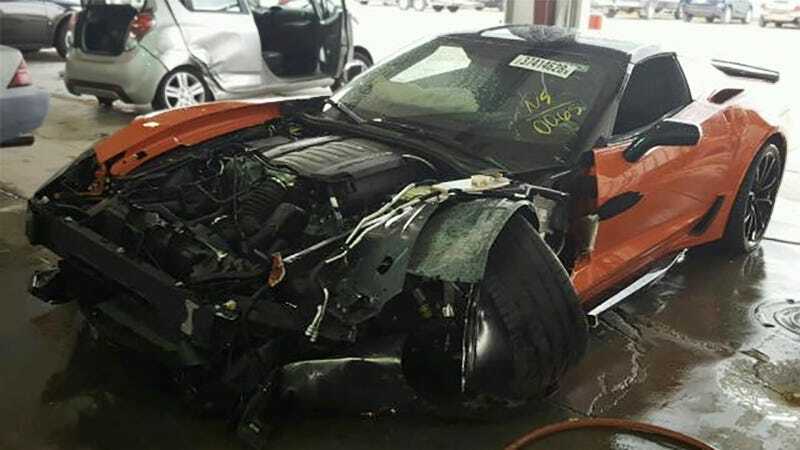 ET: As Chris U. pointed out on Twitter, the Corvette we’re looking at here sure looks exactly like one that wiped out on an interstate onramp in South Dakota back in May according to local news out there. Looks like a relatively minor, albeit embarrassing, incident. Here’s hoping its 460 horsepower engine will live on in somebody’s bitchin’ project car. Or perhaps someone will turn this into a rat rod, salvage title be damned. It’s already halfway to the “open wheel” look, anyway. I’ll also hope nobody was hurt in whatever incident sent this Corvette to its early grave. Looks like the glass is intact, so we can be optimistic there. If you think you’re the one to save or strip the rest of this hulk, it’s for sale at a Copart auction in Lincoln, Nebraska for $8,600 as I write this. The car would have listed for about $70,000 when it was fresh, 15 miles ago. Dang, that’s like $4,600 a mile to own this car if the driver’s insurance doesn’t help them out. At least that should make your own cars seem a little less economically disastrous by comparison, right? Hat tip to Broken Cars Report on Twitter!